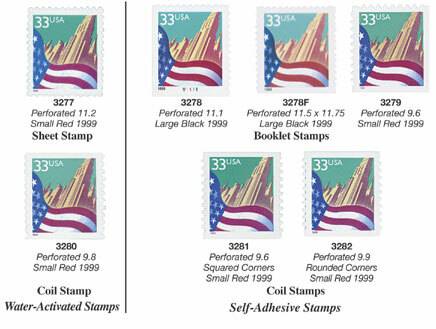 Although stamps like the Flag Over City series may look alike at first glance, there are minor differences which make each stamp unique. Once you know what these differences are, identifying the stamps is a snap. Mint self-adhesive stamps purchased from a dealer (like Mystic) will be attached to a paper backing – water-activated stamps won’t. While used self-adhesive stamps aren’t attached to backing paper, they can be identified by their smooth, wavy perforations. Perforations on water-activated stamps are uneven and have bits of paper protruding from the tip of the perforation. Sheet stamps and coil stamps can be identified by looking at their edges. Sheet stamps are perforated on all four sides. Coil stamps have two straight edges on opposite sides. Booklet stamps may be a bit more tricky to identify. For instance, #3278 and #3278F both have a black 1999 date. The difference is that #3278 is perforated 11.1, while #3278F is perforated 11.5 x 11.75. #3279 has a red 1999. Self-adhesive coil stamps are best identified by looking at their corners. Some have squared corners, while others have rounded corners. There may also be a slight difference in the perforations. With the tips outlined above and a good reference book, like Mystic’s U.S. Stamp Catalog or Scott’s U.S. Specialized Catalog, you’ll be able to identify even the toughest modern issues in no time. This entry was posted in General Stamp Collecting. Bookmark the permalink. One Response to "How to Identify the Stamps in the Flag Over City Series"
I enjoy your flag stamp guides very much. Keep up the good work. Thank yoy very much!! !